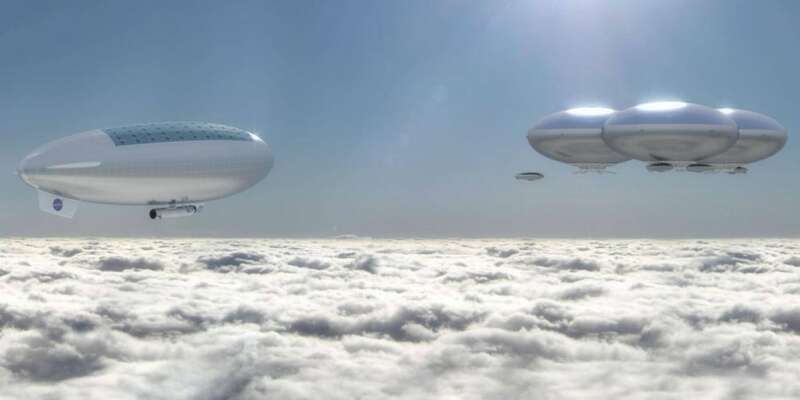 NASA has a plan to let humans soar above the clouds on Venus; Proposed "HAVOC" mission would send a blimp-like airship to Earth's nearest neighbor. We worked out that a small rocket with a living area to do work in venus under such a large blimp at the temporate zone and pressure would not only yield some great science but would give another place to go to. 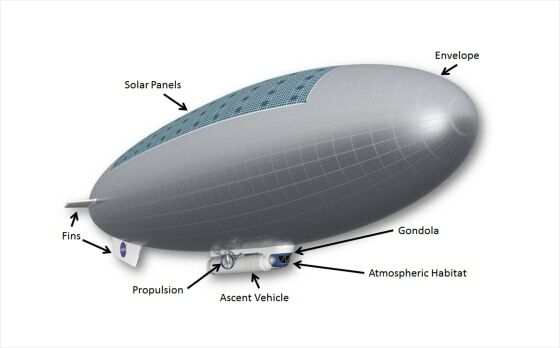 The team has sketched out plans for and conducted small-scale tests of a blimp-like airship that would ferry a crew of two on a month-long expedition above the Venusian cloudtops. It would begin with two launches to Venus. One spacecraft would be for the crew. The other would be a robotic cargo ship carrying the airship, which would be folded up inside a 100-foot-long capsule. The voyage from Earth to Venus would take about 100 days using a powerful rocket like NASA's upcoming Space Launch System. Falling from orbit, the capsule would plunge into Venus's atmosphere at 16,000 mph. White-hot atmospheric friction and a huge supersonic parachute would slow things to a more manageable 90 mph. At that point, the capsule would jettison its outer shell, the airship would unfurl, and canisters of helium would inflate it to a volume of 2.7 million cubic feet. At the conclusion of the 30-day mission, the capsule would detach from the airship and transport the astronauts back into orbit around Venus. There they would rendezvous with the main crew vessel, which would take them back to Earth. The return trip would take a bit longer — about 300 days — because the rocket would have to fight the sun's gravitational attraction. But at a total length of about 450 days, the mission would be significantly shorter than a mission to Mars, which could take a full two years. If we were to stay longer in venus atmosphere we could even do insitu fuel for the rocket and trade that mass for supplies without changing the base levels of the mission as the amount of supplies would be a good portion of the mass for the people to survive versus the fully fueled rocket. It really is an intriguing idea, but I fail to see the point in sending humans into the atmosphere for a 30 day high stakes joy ride. Sending an ITV to LVO packed with lots of microprobes, robotic ISRU experiments, and powerful high resolution radars could help us understand a bit more about the planet's atmosphere and surface composition. In some ways, it's easier to live there than Mars. I'm not comfortable with the idea of relying on the airship to unfurl in order to avoid crashing, particularly not at 90mph in a dense atmosphere. I'd send the airship down first, and have the people follow in a spaceplane of some kind. We know it's possible to dock planes with airships, even though we haven't done so for decades. kbd512 the early stages are on a first mission is survival with science, insitu manufacturing of fuel & Oxygen, solving the food supply chain and gardening for longer missions, probe the atmophere a little bit lower over time via planes, gliders, blimps. yes probe for better ground radar views, yes test microbial life at each step of going towards the surface and give it a means to prosper. Terraformer the unfurling will be fully tested before going to venus to be sure that men will be safe as we can test it here with dropping to the jet stream level to get all the data on performance of design. The original concept we were taling about was a pagasus sized rocket for return to orbit for the blimp to make use of for the crews flight home with a genesis or beam sized inflatable to couple to for the crew to stay in. All but for a few key technology and design builds all seems just about ready all but for the sub assmbly or heavy lift. I think we should characterize atmospheric chemical composition, pressures, and temperatures before committing human lives. Fundamental accurate knowledge of what's in the atmosphere is crucial to survival. Asteroid mining could make water available to future Venusians for agriculture. There's supposedly enough sulfuric acid to combine with CO2 to make water, but more data is required. Long thread, haven't had time to read it in its entirety yet. While most are probably thinking of how to cool down Venus, I'm thinking of heating it up sufficiently to get rid of most of its atmosphere. By placing orbital mirrors to deflect sun rays toward Venus. Once the atmosphere has reduced enough the mirrors can simply be turned away. With the thinned atmosphere Venus should cool down. You would also rid it of its nitrogen, whilst breaking up the CO2 and causing a massive layer of carbon to form on the surface. Most new members who register in this forum never post anything. Congratulations on your setting the pace for others. Your idea is one which can be modeled in software. Are you in a position to pursue an answer to your hypothesis? It will take some time, some money (but not necessarily a lot), and above all, determination to master a lot of new material you may not have studied before. There are members of this forum with (a) experience (b) education (c) real world judgement. You can earn their participation by showing that you have what it takes to pursue your hypothesis to a conclusion, however long it may take. If it were me doing this, it would definitely take a long time, but you may be younger and more energetic. This strikes me as an interesting idea and one worth considering. Terraformer raised two objections: Breaking up the CO2 and loss of nitrogen. I don't regard a layer of carbon as being a huge loss. It's fertilizer, after all, which on a previously lifeless world will without a doubt be necessary. Venus has a thick atmosphere though, so if all the atmospheric carbon turns into ground carbon it would be a layer 150-300 m thick depending on density. Loss of nitrogen is a much more serious concern. Venus has 3.5 bar of nitrogen, and when all is said and done we want most of it to stay on planet (not just as a dilutant gas but also as a supply for the belowground part of the nitrogen cycle). So this means you want to be selective if you can. But how? One thing you might do would be to direct your light so that it mostly is absorbed by the upper atmosphere in wavelengths absorbed by CO2 but not by Nitrogen. In the ideal case, you would be adding enough energy to directly accelerate the molecules up to Venus escape velocity, which is 10.3 km/s. This corresponds to 53 MJ/kg or 0.5 eV/amu. With a 44 amu CO2 molecule this corresponds to a photon with a wavelength of 56 nm. This is considered extreme UV: The Sun makes very little of it, it's extremely difficult to reflect, and it's actually preferentially absorbed by Nitrogen over CO2. This makes me wonder if there's a way to pre-fix the Nitrogen so that it can be protected from escape and accessed later if needed. I don't have any ideas on that score but maybe someone else does. If you're not trying to be selective, frying the exobase and upper atmosphere with IR reflected from the Sun glancing through the atmosphere seems like a good way to go about baking off as much as you can as quickly as you can. Might not even need to heat the planet all that much. Here's a concern with that: All that CO2 is going to go somewhere. Venus's atmosphere contains ~4.5e20 kg of CO2. If you bake it off, it has to go somewhere. My guess will be it would be swept outwards. The next planet out from Venus is Earth. Earth already has more CO2 in its atmosphere than we'd like, plus a strong gravity well that will tend to draw gases in. Since 1750, the atmosphere has added roughly 150 ppm of CO2, corresponding to roughly 1e15 kg. That is to say, if even 2 grams out of every tonne (0.0002%) of the gas from Venus's atmosphere ends up on Earth, it will have a bigger effect on Earth's climate than the entirety of human emissions in the last 250 years. Now a project like this one is at least a hundred years out, and if you're doing planetary engineering and blowing away 100 bars of CO2 you can probably also take care of 100 ppm of CO2 in Earth's atmosphere (indeed, it's likely that we as a species will cut our teeth in planetary engineering by drawing down CO2 from the atmosphere) but blowing 5e20 kg of gas into interplanetary space (By my extremely rough estimate, 5,000,000 times more gas than exists in the solar wind between the orbits of Mercury and Neptune at any given time) will probably affect something, sooner or later. Any viable plan to terraform Venus probably requires the importation of huge amounts of water (about as much as the atmosphere we're talking about blowing off) and compared to that the amount of water there now is quite minimal. Likewise, any plan to terraform Venus probably needs to be a two-stage one. Rather than exporting CO2 and importing water, it seems like it might be more efficient to turn all of Venus into one big Bosch Reactor. Send Hydrogen in from the outer system somewhere (Uranus or Neptune?) or out from the Sun (harder), fill the atmosphere with iron nanoparticle dust (a good catalyst--might not be necessary though), keep the whole thing at 700 C, and let it go. 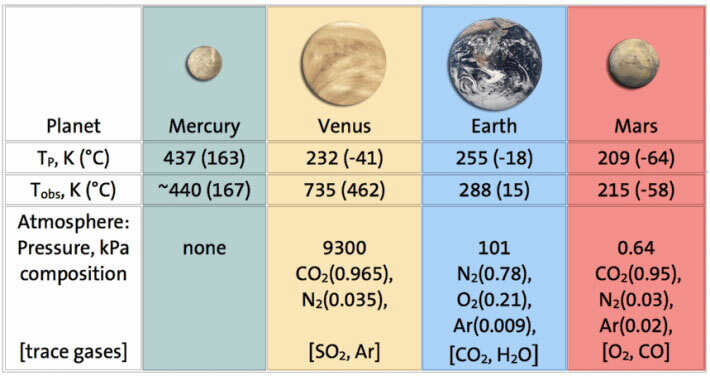 If you start with Venus's 4.5e20 kg of CO2 and add 4e19 kg of H2, you'll end up with 3.6e20 kg of water, 1.2e19 kg of carbon, and 3.5 bar of atmospheric Nitrogen. The carbon will blanket the planet to a depth of 150-300 m and the water to a depth of 500-600 m. Water, being a liquid, would not pool evenly and would instead form oceans. Eyeballing a map of Venus they would cover 30-70% of the planet (Somewhere between Mars and Earth if the former is terraformed), which seems like a good amount. In order to allow the reactions to continue you'd want to keep the planet hot for as long as possible using mirrors, meaning the water would remain in the atmosphere as steam. When you want the reactions to stop, take away the mirrors (or even reposition them to block sunlight) and pull your camera out for the most incredible rainstorms of all time. Here's a number: If the Earth were a sphere of uniform temperature with no atmosphere and perfect emissivity (although retaining its albedo of 0.3), its temperature would be 255 K. This is about 15 K warmer than the Moon (as I estimated in this post), which makes sense because slower rotation lowers the mean temperature due to the T^4 Law. Using this same calculation, Venus would be 301 K, which is substantially hotter. That should come as no surprise, since it's closer to the Sun. Atmospheres are weird though, and it's possible there are ways to make it livable with an Earth-style atmosphere, maybe even (though it seems unlikely) without sunshades. With a nod to tahanson43206, Terraformer, Spacenut, and Josh, (I will get back to you). I also encourage your continuation of thinking on this. I am rather a blabber mouth and it makes me feel guilty for intruding so much, but this discussion is lively and prompts me to think about it. If you and the others will forgive me, perhaps I can assist the process. I personally am of the mind to gradually harvest the atmosphere of Venus to orbit, providing we find that it has no life. This then would satisfy Rays desire to remove much atmosphere from Venus, and by conserving the atmosphere harvested, then provides protection for the Earth from the concerns of Josh. It also deals with Terraformers concern about a large residue of Carbon, and loosing Nitrogen. We will also avoid turning Venus into another Mercury, I think (Spacenuts concern). Let me spew my thoughts then which you have all prompted. Of course I will expect that you will all review them and give criticisms as you feel you must need to. To start with, we do need to find out if the particles in the clouds of Venus are living microbes, and also if they are living, if they have a form of intelligence like a hive mind of bees, or lets say some infectious organisms. If there is life, then I guess I would be very hard pressed to justify messing with Venus. The good news is unlike Mars, it should be relatively simple for probes to take a proper look at that. Specifically what do I want? Well, I want to populate the Orbitsphere of Venus with synthetic gravity cylinders for habitation. The interiors at least in part pressurized by Venus atmospheric component gasses. I propose the use of sky hooks, but in this case the "Hooks" will not reach to the surface, but will generally capture gasses into themselves. How we maintain the orbits of the skyhooks is a matter I will deal with later. For this it would be great to consider expanding the atmosphere of Venus with heat. Lift parts of it up higher in the gravity well, and it should be that much easier to lift the gasses into orbit. Of course, to avoid loosing gas to interplanetary space, limits must be set on that expansion. Also a planetary magnetic field might be considered. OK, keeping the skyhooks in orbit. Well there may be several possibilities. Without a magnetic field, you could sail on the solar wind to harvest orbital momentum. If you do implement a global magnetic field, then you may be able to navigate in that field with tether methods. That will actually be somewhat hard. It would mean that you grab gobs of Venus atmosphere to orbit, and then separate out the parts you want to keep, and spew out the "Tailings" in a propulsive method such as tether propulsion, or perhaps some kind of a plasma mass driver with a magnetic pulsing nozzle. Requiring energy of course. If you lift up gas from the atmosphere, it pulls down your skyhooks orbit, you then have to push your orbit higher somehow. Now I want cloud cities, but I hate Sulfuric Acid. As it turns out, it is U.V. that turns water vapor and Sulfur Dioxide into Sulfuric Acid. The heat at the base of the clouds, decomposes Sulfuric Acid into water vapor and Sulfur Dioxide. So, if we can get rid of enough of the U.V. then the thermal decomposition process should become more dominant, and we might hope to reduce the Sulfuric Acid to tolerable levels. We should want Ozone. But the atmosphere of Venus is so dry that Oxygen levitates electrostatically outward to where the solar wind can carry it away. I cannot guarantee that it is possible, but I am thinking that if the environment of Venus is nice enough to lift Oxygen produced with U.V. out to where the solar wind can sweep it away, then perhaps if we put a global magnetic field around Venus we can fend off the solar wind, and collect the Oxygen on top of the atmosphere, and I might hope that some of it will become Ozone under the action of U.V., and if so, will block the U.V. This in turn will protect the remnant H20, and Sulfur Dioxide from being converted back into Sulfuric Acid. The hope then is to have less acid clouds. Sulfur Dioxide is poisonous, but so is CO2, and technically Nitrogen, if it does not have sufficient Oxygen. And so on. We are a very long time removed from a day where Venus would have a breathable atmosphere. So if my speculative thinking works out, then we will have synthetic gravity habitats in the orbit of Venus, and they will be supplied with Carbon, Nitrogen, Ect. from the atmosphere of Venus, and we will also want to move other materials in from the solar system. Perhaps small asteroids captured by intentionally manipulated ballistic capture? And we could have cloud cities in a less acidic atmosphere. I also would intend to have robots which could go to the surface to mine materials. They would be like gliders, have some of the characteristics of lighter than air vehicles, and would use fluids as ballast. Various fluids available. CO2, H2O, N2, other. The fluids would cool the robots while down on the surface, and when the fluids expired from evaporation, the robots would float back up with their mining payload, back to the cloud cities. Ray wants to puff up the atmosphere of Venus. That could be useful. Mirrors could be a part of it. But how about super greenhouse gasses? CF3SF5 is a gas at room temperature with a boiling point of 253 K and an enthalpy of vaporisation of 20 kJ mol-1. The gas was first detected in the Earth's atmosphere in 2000,1 by which time the related SF6 molecule had already been identified as a potential greenhouse gas.2 The source of CF3SF5 is believed to be anthropogenic, and most likely a breakdown product of the dielectric molecule SF6 in high-voltage equipment. The trends in concentration levels of SF6 and CF3SF5 have tracked each other closely over the past 30-40 years (Fig 1 (a)), suggesting that CF3SF5 is probably produced in the electronics industry via the recombination of CF3 and SF5 free radicals. * Ground-based observations detected various minor components of the Venus atmosphere, including the gases hydrochloric and hydrofluoric acid (1967), carbon monoxide (1968), water (1972), and sulfuric acid (1978). In 1973, it was found that the upper cloud layer is composed of sulfuric acid droplets. So using mirrors and super greenhouse gasses manufactured in the cloud cities you may be able to puff up the atmosphere as much as is useful and yet not detrimental to the utilization of the resources of Venus. And yes, you could bring in more Hydrogen per the notions of Josh. I might say that asteroids with hydrated minerals might be a start. If you had some water left over from the manufacture of the orbital habitats, you could inject it into the atmosphere of Venus. Eventually you make choices. Perhaps the synthetic gravity machines mostly travel to solar orbital locations. Solar powered in some cases, and if fusion even becomes real then they can to as far as the Oort cloud and beyond. As for Venus, perhaps you do completely terraform it some day. I'm done. Hope I have not disrupted your conversation too much. Quote from my previous post: "With a nod to tahanson43206, Terraformer, Spacenut, and Josh, (I will get back to you)." I did a typo in the previous post. Typed "not" when I intended "nod". Hope I did not accidentally insult anyone. Did not intend insult. Well, I guess all is silent. I don't think I can do more damage, so I guess I will do something more. There is this from Europe of course, an electric rocket that breaths air. So for Venus, I am thinking that something on that order could be quite useful. Should it be accomplished to place a magnetic field around Venus and that then pool Oxygen at the top of the atmosphere, then could an electric rocket both give lift to an atmospheric scooping process, an atmosphere processing method? And ideally collecting Carbon, Nitrogen, trace gasses, some Oxygen, and then I would hope assisting in spewing out Oxygen as propulsion fluid, where the U.V. we hope will generate Ozone at the top of the atmosphere. And even the rocket(s) could perhaps spew Ozone, if the U.V. does not efficiently create it. Carbon will be a good building material in space, to help manufacture synthetic gravity machines (Habitats). Sulfur would be as well. I am thinking it will be very hard to get the Sulfur scooped up though. A method to get it to orbit would be nice. My memory from a book suggests that Sulfur is a very strong, perhaps even metal-like material in the vacuum of space. Perhaps that is true. In that case then the Sulfur of Venus could also be used in a correct method to help build habitats in space. Of course as I said a method to get it to orbit would be needed. If you did though, then you would eliminate a poison from the atmosphere of Venus, and you might hope that the clouds would end up being water droplets. Of course I think Venus has erupting volcano's, and I expect them to spew more Sulfur into the atmosphere. More building material though, if you can indeed get it to orbit. If this could all work, then Venus is the gem of the solar system after the Earth. Mars of course offers it's own good things down the line. Given activities like SpaceX and Blue Origins, the future of the human race could be extremely bright I think. The article at the link above should show up as "Sulfur in Construction Materials"
The application appears to be use in mortar as a bonding agent. The use of sulfur is one of the bricks that can be compressed on mars. The atmospher to make Venus useable only comes in just so many options which Viod and others are talking about. 1. Sequestering, locking it up into other compunds that are not toxic to man and are not released by the current temperature conditions on venus. 2. Breaking down the toxic atmosphere elements to what we need to save storing and transporting or Sequestering what we do not want. 3. Coverting what is toxic into something that we do need and disposing of the unused elelments, storing for later, transporting them elsewhere or Sequester them. All of these are easier one in the thick of the atmospher as Mars is telling us for concentrating its very thin atmospher can be for energy and mass to get it done. The storage of the atmosphere is the easiest with blimp and tanks to keep it bouyant in the atmosphere for later use. Converting the co2 to ozone would be a plus for venus to block the UV. Import nitrogen or nitroxides to sink to the surface of venus. Once venus starts to cool I would expect a magnetic field to start to strengthen and it would be nice if we could create a north and south domain when it starts to change. While I enjoyed your post Spacenut, I would make the point that from my view, Venus if not inhabited by life, is like a cake in an oven, don't burn your fingers on it but it has a lot to offer. I don't think we would need to bring Nitrogen to Venus. In fact I would plan to take Nitrogen from it. I would also take almost all of the Carbon and huge amounts of Oxygen. How much would depend on what the future owners what to do. To start with I would do synthetic gravity habitats in the Orbitsphere. I would think initially the metals and ceramic materials could come from elsewhere. Either asteroids captured to the Venus Orbitsphere, or from another planet/moon. Say our Moon. Let suppose that we could used telepresence both directed from Earth and habitats on the Moon, and with assistance from increasingly capable A.I. I would not shoot dirt into the sky from the Moon. I would look at building whole giant habitats on the surface of the Moon. They would be partially completed, and would if possible have a shape which would be usable for a solid rocket launch. Perhaps 3D printed solid rocket fuel. Boost the habs to orbit by that method, and then next they would be change in a metamorphic way to fly to Venus. Perhaps loaded with liquid Oxygen from the Moon. Then that monopropellant would be ejected from them by some means to create a propulsive reaction. I have mentioned several methods on this site. Then flown to Venus, filled with an Oxygen dominated atmosphere, with a minority gas of Nitrogen. At the same time other materials can be used to make the habs stronger. Carbon including materials such as plastic and in fact Carbon Fiber materials as well. Carbon could also make wood, should you choose to grow trees in your hab as it was being set up. And then there is Sulfur. Thanks for mentioning the use of Sulfur as a building material on Mars, a concrete like material. Thanks tahanson43206 and SpaceNut. I still say that there may be superpowers for Sulfur in a vacuum. For instance I wonder about Carbon Fibers, with a Sulfur dominated bonding paste. Granted it would be flammable, but if you used it outside your hab in the vacuum of space, then there should be little or no risk of fire. It might be used to re-enforce the canister of the hab, to make the pressure shell stronger. I think it may be possible to get the Nitrogen, Carbon, Oxygen and some other materials into orbit with something like a skyhook. I also think a skyhook could get the Sulfur up, but first it would have to be refined in cloud cities, and then flown on sub-orbital ships which the skyhook would interact with to get the Sulfur up to orbit. My preference would be that the cloud cities would be in a dominantly Sulfur Dioxide cloud with some H2O. I do not like Sulfuric Acid Clouds for cloud cities. I have speculated previously that if the U.V. could be blocked from shining on the Sulfur Dioxide and H20, Sulfuric Acid creation would be reduced. The heat at the base of the clouds would decompose the Sulfuric Acid existing into Sulfur Dioxide and H20. So, Orbitsphere habitation, then Cloud City habitations, and then robots that commute to the surface of Venus to gather regolith to bring up to the cloud cities. Could some of that then processed Venus regolith go to orbit? I think so, if there is an economic justification. So, then how much Habitation could be created? I think I would be enormous. For one thing your requirements for atmosphere for humans could be a 250 to 330 mb pressure. From what GW has said I would think more towards 330. Then the question is what is the proper Oxygen/Nitrogen mix? Perhaps 60% Oxygen / 40% Nitrogen? That would be if you intended to have all of your humans, gardens, and other critters in the same environmental conditions. But I would say that for Humans you might want a different mixture at a higher pressure. And for the humans as necessary pleasing garden situations. But for agriculture, if robots and automation are presumed to be of a higher than even now, most of the agriculture at a number such as 70 mb (I believe Robert may have mentioned such). And then for microbial goop, much less. In fact I believe that if you had a coating of water at say 22 degF / -5.55555556 degC, you could have liquid salty water at considerably less than 6 mb. That chamber could be as vast as you might need I think. So I intend to have a liquid film condense by electric force on the interior of a gas filled chamber. By doing this, you might hope to hope to farm microbes on a film of water, without having to pressurize your growth chamber very much at all. But I really am goofing about on the above. The point is that for microbe farming you could have vast areas and volumes at low pressures, where you could do microbial farming. And it would not take up that much of the atmospheric resource that Venus has to give. So in other words a future of vast plentitude for the human race is possibly available. So what to do with all the Oxygen? Well it can be propellant, and perhaps it might be possible to deliver some Oxygen and Nitrogen to Mars. I don't yet advise it but it might work into a bigger plan. Suppose eventually fusion power becomes real. Then the outer solar system with it's plentiful resources, including Nitrogen become a homeland. You may fly many of your previously Venus associated habs out to various locations. Triton, Pluto, lots of Nitrogen. What about Saturn, Uranus, and Neptune, can you mine them for stuff? And the Kepler belt and the Oort cloud. From Venus to the Oort cloud, and other star systems and perhaps their Oort clouds (Should they have such). And lets not forget ~~~100 to 100,000 rogue planets for each star that has planets??? Ya, I don't know how many, lets just say lots and lots. And then the people who run Venus will have to decide if they want to get rid of the cloud cities and actually completely terraform Venus. I suspect that I just may be dead and gone by then Not my problem I should think. The climate change topic has gotten to the numbers and equations for how hot we expect to see venus by the many posts on the page. To do a comparison amount of the gasses we need to take into account the pressure and percentage to solve for how much we have. venus is 93 Bar with Earth just 1 Bar. I am thinking that 2 bar pressure would be sustainable and not to difficult to adapt to. Increasing the partial pressure of Oxygen may produce some damage to a human who is exposed to it for a long period. Higher pressure of Nitrogen will produce a narcotic effect, but is probably within our rang of ability at less than 2 bar. Bends may also occur on return to regular earth pressure, but we know how to deal with that, using helium and slow depressurisation. Divers depending on diving depth with change up the gas mixture being used to aid in the dive and return to surface time for as elderflower meantion to stop one from getting the bends. RayRobertson I did not intend to displace you. I have regrets if I did put you off. To the other members. Interesting....You are fixated on Venus it self as a final product. That is not at all how I see it. And anyway the final arbiters will be those who live in that presumed possible next era. That in my opinion is one of the most massive errors of terraforming schemes. First of all, it is important for an advanced people to have the ability to work with delayed gratification. That is one of the things that may separate us from animals. It is how we don't all end up in opium dens rotting. But for any endeavor for which we might hope to gather momentum towards its solution, we require payoffs along the way. No-one is going to sign up for a maybe payday for their great, great, great, great grandchildren (Maybe). There is not enough wealth to float such a project. Who can know what technology might give to humans abilities? To change the spin of a planet? To modify it's atmosphere? To move various kinds of matter here and there? Well now is not the time to say what will be. We just can't know. So any notions of humans becoming extra-Earth have to be updated constantly. There is no way around that. The questions I might have about a modified Venus as an end product as the only purpose of dealing with it is what will the end product be? Could you have perhaps had something different, better? And could you have utilized the pieces you want to take away from it for a benefit of the human race? If your focus is going to be on turning Venus into another Earth, I have reservations about it. All the evidence is that Venus has a different history, and other than the fact that it is a somewhat smaller planet, and orbits our same sun, it isn't that much like Earth. So, harmony with it will be different than harmony with Earth. As I have previously indicated, it is very hard to know what kind of powers the human types may have in the future. It is even possible that it is none of my business. But then as is necessary, lets say we did attempt to Earth-Form Venus. That is make it as Earth like as we might hope to do. That I am guessing could take hundreds, thousands of years. Who gets a payday in a timely manner with that? It does not seem a project I would invest my retirement funds, my Medicare funds, my SSI finds, into. OK, so even though I think Venus would remain a volcanic hell world, let suppose we try to impose an Earth surface upon it as our compulsive obsession. We have mountains on Venus that are as tall as they are due to the stiffness of the materials of them due to the lack of moisture in them. What happens if we import water to Venus? I'm getting mind tired already. I will try to hold on for a bit. OK, you bleed off the atmosphere of Venus, to waste, or to a good purpose (I hope). Then if Venus were in other ways like Earth, the proper atmosphere would be 500 mb. 42%? Oxygen, 58% mostly Nitrogen, and some other stuff. If Venus had a 24 hour day, then that might hope to approximate the thermal balance of Earth. But of course there is not a 24 hour day/night period. Unless you can alter that, then you must adapt to an alien pseudo Earth (A necessary requirement anyway little ones. It is an alien planet. ). OK, so you have a 500 mb pressure atmosphere, and your mix is suitable to give Venus an average temperature value similar to Earth. Still the near noon of the days will be unbearable. The near midnights of the night will require you to shelter against Antarctic cold. Still perhaps you could . I don't see how trees may make it except near the poles. Perhaps grasslands elsewhere, green in the spring and fall. Likely on fire in the near noon times. So, lets say we can alter the planets spin. Do we stop its spin entirely? That would be easier. Then wind and solar would be fantastic sources of power. Weird things on the dark side? Like a tidal locked planet of a red dwarf? Hm... Weird. Well then do we make it 24 hours? Still to hot in the day. Rather too cold in the night. Polar areas OK? Not sure. And yet the actual treasure may be elsewhere. Sure if future, furture generations want to obsess about what to do with Venus itself, the let them. But more attainable closer to the now is a harvest of the materials that Venus might yield. While I am happy to hope that Elon/SpaceX will do the Mars dream, I am very much more in tune with Jeff Bezos/Blue Origins. I do think the hope is for vast numbers of humans in space, most likely not on planets. And so I see Venus as a giant pudding. Don't burn your fingers, it is just out of the oven. Think of it as hot soup if you like. Well rogue planets of course, and then other solar systems. There may be so many of them 100 to 100,000 for every star. Not all easy to deal with by any means. Query for Rogue Planets. There is so much information. I am tired. Good night. So, in my view the first and most useful value of Venus would be a supply of volatile materials. Oxygen in my view has its obvious uses, but I also think that since it is so abundant in the solar system, then it is a material to eject from propulsion systems, which will not contribute to collision hazards over time. So, then that would likely be the use of a great amount of the Oxygen from CO2 from the atmosphere of Venus. A supply chain could be set up, without the advent of fusion power. #1 Get solid materials from the Moon, and Oxygen. Fashion that into synthetic gravity habitats. #2 Move many of them to Venus orbit. Fill as needed with Nitrogen. Re-enforce the devices with Carbon and Sulfur as may be practical. #3 Move many of these habitats outward. I think that the magnetosphere of Jupiter would be interesting, but still solar power capable. The trojans may contain Nitrogen and other things as well. If fusion is made real, then there are very few limits. Not just the Moon could supply synthetic gravity habitats, but eventually I suppose Mercury. And then you could "Fly" the devices way out there to get more Nitrogen into them. Triton, Pluto and other locations could supply valuable things. And then to go ahead to continue out towards "Steppenwolf" planets, and also perhaps smaller objects in the Kuiper Belt(s), Oort Cloud, and beyond. Eventually to other star systems. I used to not like the idea of humanity building as much synthetic habitat as possible. It was said that in 10,000 years that would deplete our solar system of all volatiles. That would be because even the best designs would leak, and the solar wind would carry off this material. That sounded like a dead end. But if it turns out to be true that there are a large number of "Steppenwolf" worlds and Gas/Ice Giant worlds with moons and many ejected dwarf planets, then the picture changes. You have an unending source of various materials. Things ejected from stellar systems, and the materials placed there by the history of the universe and it's objects. Stars themselves seem like they may be of a lesser interest. The average temperature on Venus surface is 864 degrees Fahrenheit (462 degrees Celsius) with a blanket atmosphere from getting cooler. Lead would melt on the surface of the planet, where the temperature is around 872 F (467 C). Temperatures are cooler in the upper atmosphere, ranging from (minus 43 C) to (minus 173 C). Temperature changes slightly traveling through the atmosphere, growing cooler farther away from the surface. Which tells me that the heat is coming from volcanic sources as well as the solar input. Venus's solar radiance is about 2613.9 watts per square meter on orbit. I am going to refer all to the calculation of the atmospher in another topic by first post, second post in topc, and continuing with more posts on the 7 page by JoshNh4. The average surface temperature of the Earth, day or night, is between 57.2 and 61 degrees Fahrenheit. A thin atmospher of 1 bar would be hot still as the amount of solar would penetrating all the way to the surface has gotten cleared of all moisture as the acid is gone and with it the water. So I would think that its probably 2x the earth temperatures at a minimum. So its not going to cool to a short sleeve and going to no atmospher means temperature more like the moons cold side for Venus on its dark side and even hotter than the sun lite side of the moon on venus sun facing side. The temperature of the moon during the night is -233 Celsius and 123 Celsius during the day. It is because the Moon doesn't have an atmosphere to block the Sun ray's. I see that last nights post dropped the pressure to partial to aid in that temperature lowering. Not sure how much the ground will have cooled as its temperature seems to be from other sources. Something else that we do not know is if the rotation of venus will speed up since the huge atmospheric drag will be gone. One wonders if we could shove mercury outward enough for a venus capture to creat a moon for the planet and to if would be beneficial or not. Your second post is about saving up what we would remove frrom venus for other uses which starts a trade systems for those places that need that resource. One could in an automated cloud system blimp make carbon composite tanks for the captured gas to stay in until we decide to park it somewhere else for later use.